The Acoustic Energy AEGIS EVO One is a free-range bird of a bookshelf speaker. Say you want an EVO? Give it some space to spread its wings. Let it play naturally in the wide-open spaces of your den or living room, away from confined corners and certainly never on a bookshelf. Leave that bookshelf for your volumes of Greek mythology reserved for deciphering names of loudspeakers. (You'll find that Aegis was the shield borne by Zeus.) The EVO, as in EVOlution, updates the original AEGIS One with a new 1" silk-dome tweeter in an aluminum faceplate, an aluminum diecast chassis for the midbass driver, biwirable speaker terminals and a minor change in cabinet cosmetics. Though often included in the budget-bookshelf class, the original AEGIS always seemed too big for the part. The AEGIS just had more in common with audiophile monitors, from its size (14"H x 7.5"W x 9"D), its weight (15 pounds each), and its classic British sound (laid-back), to its precise placement requirements away from surrounding walls and, preferably, mounted on rigid stands. The reserved sound, limited bass, and somewhat finicky setup might not appeal to all tastes, but the AEGIS EVO One, like its predecessor, is among the least-expensive gateways into high-end loudspeakers. Acoustic Energy put itself on the high-end map more than a decade ago with the AE-1, the first minimonitor all-metal revue -- a metal-dome tweeter in tandem with a spun-aluminum-cone bass driver made by hand on a lathe. The AEGIS EVO One, in a concession to mass-market pricing, uses a less-expensive, mass-produced metal-alloy midbass driver and is manufactured in the British company's Malaysia plant. Despite the speaker's considerable size and heft, the midbass driver is surprisingly small, generously measured at 5", in a bass-reflex design with a 2" rear port. And regardless of a trend toward titanium-dome tweeters, with their greater power handling and high-frequency extension -- PSB and B&W, for example, have converted their budget speakers to metal-dome tweeters and Paradigm has used them for years in low-cost speakers -- Acoustic Energy merely traded one brand (VIFA) of silk-fabric-dome tweeter for another. It preferred the silk smoothness to the titanium sizzle. B&W, meanwhile, added both a metal-dome tweeter and increased the bass-driver size, to 6", in the DM303. Acoustic Energy takes a much more conservative path with the EVO. It's a refinement, not a makeover like the DM303. Some external changes are barely noticeable, like the vinyl wrap that now covers the front baffle. It looks better and adds ever so slightly to the baffle's rigidity. The basic formula remains. Build a solid cabinet of medium-density fiberboard -- a 1" baffle and 0.5" walls reinforced by unusually strong internal bracing -- to reduce resonance and accompanying distortion. Use the metal-alloy driver for tighter, cleaner bass. Stick with a soft-dome tweeter to avoid the risks of metal-dome tweeters, which can sound harsh and brittle in the wrong application. With its new vinyl-veneer finishes (choices now are black ash, dark maple, and light maple) and the partially exposed baffle -- love that bare-midriff look -- the AEGIS EVO One looks and feels like some more upwardly mobile monitors. Just try giving the cabinet a light knuckle sandwich -- it's a little rock. In solid build and mannered sonics, in fact, the EVO One reminds me of Dynaudio's $700 Audience 42. In the GoodSound! spirit, the EVO Ones were inserted into a reasonably priced system with the new Arcam A65 Plus integrated amplifier and Arcam CD62T CD player ($599 each). All equipment was on loan from Audiophile Systems Ltd. of Indianapolis, the US distributor for Acoustic Energy and Arcam. Kimber 8TC speaker cables and MIT Terminator 3 interconnects completed the system. Although biwirable speaker terminals -- here, with gold-plated posts and plastic nuts -- are a nice feature, and rare in this price class, I question biwiring's usefulness in a budget system. To try it, you'll need a second set of speaker cables or cables designed for biwiring. I used StraightWire Rhythm II, a budget cable with four individual conductors. The idea is to separate the paths of the bass (woofer) and the treble (tweeter) for greater clarity and definition. In my experience with budget setups, including this EVO-Arcam pairing, the difference is either subtle or negligible. Biamping is another story. I could see trying a low-power vacuum-tube amplifier for the treble and a more powerful solid-state amplifier for the bass with the EVO. But with the necessary two amps and a preamp with two line outputs, it wouldn't be a budget system anymore. The EVO Ones required extensive break-in time, more than 72 hours, before they started to loosen up. During that time, they were on a wooden bench in the corner of a small bedroom, mounted with dabs of a material remarkably like Blu-Tack, the preferred audiophile mounting goo. Only it wasn't blue and it didn't cost $10 a slab. The Yellow-Tak cost 89 cents at a local surplus store. Later, I moved the EVO Ones into a basement home-theater system with a Marantz SR7000 receiver, an Onkyo DV-S535 DVD player, Analysis Plus Oval 12 speaker cables and a StraightWire coaxial cable. There, the speakers stood on the cheapest of all rigid stands -- a pair of garden-variety cinderblocks -- with the tweeters aligned at ear level. Even as the EVO Ones took what seemed like forever to break in, I knew they were not to be used like ordinary bookshelf speakers. Placed less than a foot from a rear wall and in a corner of the bedroom with the left EVO almost touching the side wall, the sound was about as subtle as dropping one of those cinderblocks on a big toe. Yeow. It almost hurt listening to the gurgling, boomy bass and the barely-there highs. After more than three days, female vocals started to sound human. Diana Krall's cover of "I Can't Give You Anything But Love" from When I Look In Your Eyes [GRP 90137] was bottom-heavy, the lower frequencies vague. The midrange emerged as a strength, but there was not a lot of high-frequency extension. More of the same with the title track from Alison Krauss & Union Station's New Favorite [Rounder 0495]. 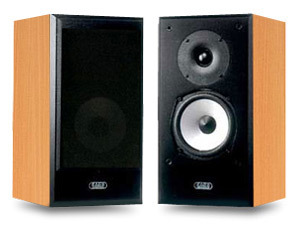 Here, I discovered the EVO Ones share yet another trait with high-end monitors -- they sound better with the grilles off. The high frequencies improved greatly when New Favorite played through the de-grilled EVOs. But that boomy bass remained. When Shane MacGowan growled through "If I Should Fall from Grace With God" on Essential Pogues [Polygram 510610], the EVOs couldn't take the strain as the volume approached 90dB. Time to call it off. My little note-to-self at that time: I would not use these speakers in this room, in this position, so close to the walls. So down to the basement. The Marantz SR7000, recently superceded by the SR7200, plays two-channel music as well as it does multichannel soundtracks. That's what sold me on it. Now, with the EVOs on cinderblocks, almost three feet from the rear walls, maybe four feet from the side walls in a space about 12' x 14', everything fell into place. The new setting restored balance to Krall's "I Can't Give You Anything But Love," with a prominent but not forward midrange, restrained high frequencies, and no more boominess in the bass region. This is what reminded me so much of the Dynaudio Audience 42. The EVOs also seemed to benefit from the added power of the 100Wpc SR7000 (the Arcam is rated at 40Wpc). Though Acoustic Energy rates the sensitivity as 89dB into an 8-ohm load, it seems even lower, perhaps because the EVOs are so laid-back. It's tempting to keep pumping the volume to get more life out of them, but soon the little midbass drivers surrender. Toeing-in the speakers maybe 10 degrees, with the tweeters directed at the listening position, adds some needed immediacy. These are not speakers for large orchestral works and maybe not even for the Pogues. Their strengths -- a rich midrange, wide soundstage, coherent if limited lows and a virtual absence of coloration associated with small-box speakers -- make them natural partners for chamber music, jazz, folk, and some of the more restrained pop and rock. Although I regularly use both the B&W DM303 and the new PSB Alpha B, I chose the DM303 for comparison because it's closer in size and price to the EVO. Without question, the DM303 is more versatile, livelier, and more efficient. It can survive placement in tight quarters, even on a bookshelf, and excels at moderate volume levels. The titanium-dome tweeter gives it a more vivid, up-front sound, almost instantly seductive. Its midbass driver, made of woven fiberglass, is larger than the EVO's but the DM303 still tilts sonically toward the higher frequencies because of that tweeter. I'm not sure I'd want the DM303 in a home-theater setup because it could get screechy at the high volume levels that soundtracks demand. In a small, two-channel system, however, the midrange clarity and the in-your-face presentation of, say, New Favorite is irresistible. The DM303, to these ears, is an exceptional budget speaker. Despite its mass-market aspirations, the AEGIS EVO One is an audiophile speaker costing less than the $300. It needs more room than the budget speakers, and rigid stands. It also requires more patience. Judged hastily, it will be dismissed as not just laid-back, but bland and lacking in emotional involvement. Give it time. If the AEGIS EVO One lacks the instant gratification, the wow factor, of some souped-up bookshelf speakers, in the long-term it sounds easier on the ears and more correct. Because it does not make a great first impression, the AEGIS EVO One will not be the first choice of impulse buyers and anyone looking for a one-punch sonic knockout. But to the audiophile on a budget, the AEGIS represents one of the lowest-cost entries into the high-end loudspeaker world. The EVO version pushes it even deeper into high-end turf. These are highly sophisticated speakers for $299 that, with the proper setup, will thrive in the wide-open spaces of your home.